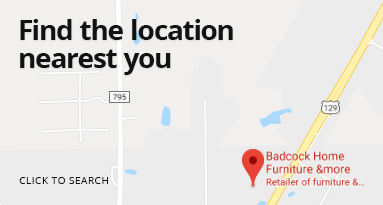 At Badcock Home Furniture &more of Carrollton, GA we believe that your home should be a place of escape and comfort. Our goal is to make that feeling of comfort a reality for everyone! Our beautiful furniture and modern appliances are easily obtainable with in-house financing that works for you. We don't want anyone to miss out on having a home they feel confident about. To help you buy confidently, we have a variety of affordable payment options and warranty types to choose from. Come visit our store at 535A Bankhead Hwy, Carrollton, GA. We are open from Monday through Friday 10:00 a.m. - 8:00 p.m., Saturday 10:00 a.m. - 7:00 p.m., and Sunday 1:00 p.m. - 6:00 p.m. When our customers are happy, it makes us happy. We'll work hard to help you find what you're looking for. Give us a call at (770) 832-0406 or visit our store today!